With major car manufacturers like Daimler and Ford already exploring the use of 3D printing for prototyping car parts, it seems inevitable that a road-worthy 3D-printed car is not too far on the horizon. The future could arrive soon thanks to KOR EcoLogic, which has teamed with Stratasys’s RedEye On Demand 3D printing business unit to fabricate a lightweight electric car that could take to the streets in about two years. 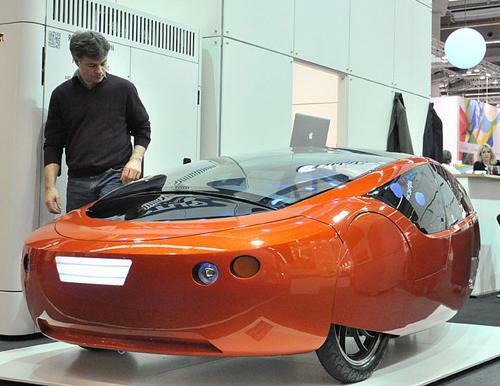 If you remember a few years ago, KOR EcoLogic president Jim Kor unveiled Urbee, his vision for the future of energy-efficient cars that can be manufactured digitally. Urbee, meant to be the first 3D-printed car, is a two-person, lightweight hybrid that ideally will be made of recyclable plastic and capable of reaching a speed of 70 mph on the freeway using a combination of electricity, and if Kor has his way, a biofuel like 100-percent ethanol. Kor developed the main body parts for Urbee in CAD files and originally just thought he would use Stratasys’s RedEye on Demand service for rapid prototyping of the large exterior panels required to build a car. “Our initial goal with Urbee 1 was just to see if we could actually make [3D print] and handle these large panels and turn them into a car body,” he said. Think of this process as a very sophisticated, computer-controlled glue gun that creates the part, layer by layer, from the bottom to the top of the part. The computer program takes its fundamental instructions from the original CAD model. In our case this would be the fender, body panel, or glass window we had designed for Urbee 1. The part starts out in the form of a continuous roll of plastic of round cross section, about the diameter of a single spaghetti noodle. This roll is fed into the 3D printer, and that noodle is what goes in to the head of the glue gun. But the plastic string that comes out of the glue gun, which is building the part layer by layer, is about the diameter of a human hair. So, amazing detail can be built into the 3D printed part, along with amazing accuracy. In this way, the FDM 3D printers tirelessly make parts, without any human intervention required from start to finish. Once Kor and his team received the full-sized body panels, they fitted them onto Urbee’s prototype chassis. Engineers also used the solid plastic 3D-printed window panels as templates for making the glass and plastic windows in Urbee 1. The team used white ABS plastic for the prototype’s exterior body, with the addition of some water-soluable grey plastic to support overhanging areas of the white plastic, Kor said. The team is now tweaking the design and deciding on material choice for Urbee 2, which likely will be some form of recyclable plastic, he said. The team is also considering and learning the CAD processes required to weave two types of materials together similar to how animal bones develop to make the Urbee 2 design even stronger. The aim for Urbee 2 once it’s been fabricated is for someone to drive from San Francisco to New York on just 10 gallons of fuel, setting a new world record. While future Urbees hopefully will use biofuel, Urbee 2 will use a gasoline-powered, small combustible engine, but only to power and charge its battery, Hansen said. Once Urbee 2 has taken to the road, it will set the stage for mass production of the cars using RedEye on Demand’s digital manufacturing service.